The playing grounds are divided off for order's sake. In the large gymnasium area, with its deep bed of tan, there are giant strides, slippery dips, steel ladders mounting to slither bars, and many other contrivances to delight the youthful heart. 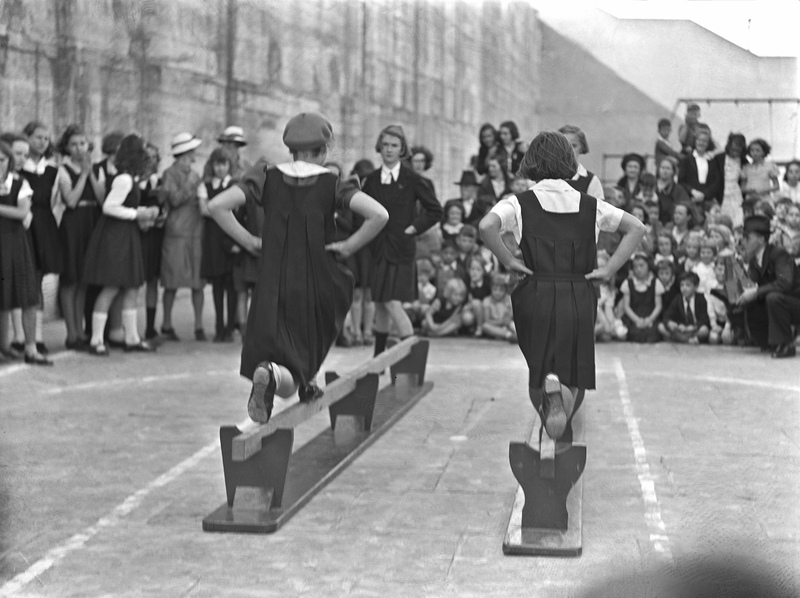 Many of Susannah Place children were regular users of the playground. Friends Ron Thompson and David Hamilton fondly recalled playing ‘racquet ball up against the wall, cricket, basketball’ and a ‘bit of a library’ that was provided for the younger children. The guy running it we used to call him ‘Skipper’ he’d turn up at 10 o’clock in the morning with the key and open it…and on school holidays …quite often about 10 or 12 kids would be waiting to get in. In 2003 Ron Thompson proudly donated his certificate of Athletic Proficiency awarded to him at the age of 15 to Susannah Place Museum. Certificate of Athletic Proficiency awarded to Ronald Thompson by the City of Sydney, 1948. Susannah Place Museum, Sydney Living Museums. 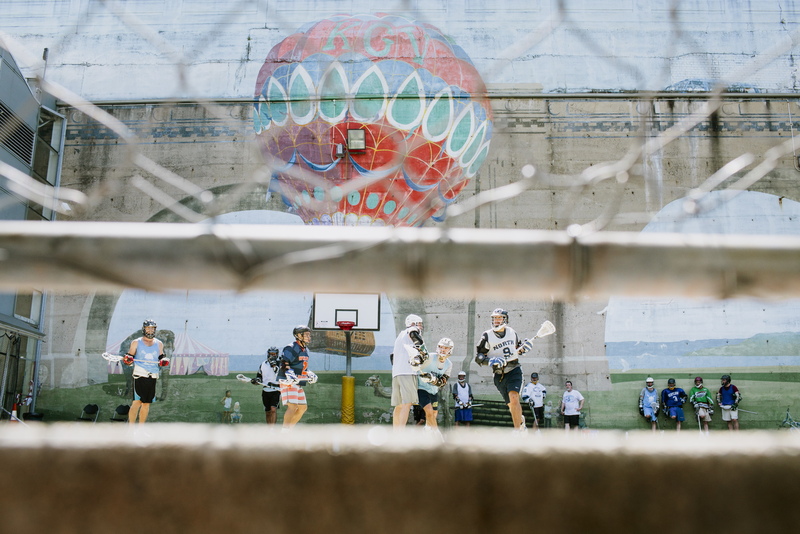 In 1983 a mural created by artist Peter Day working with the local residents was painted on the concrete wall of the playground. Standing in the hot air balloon is John Richardson who was the last supervisor of the playground. 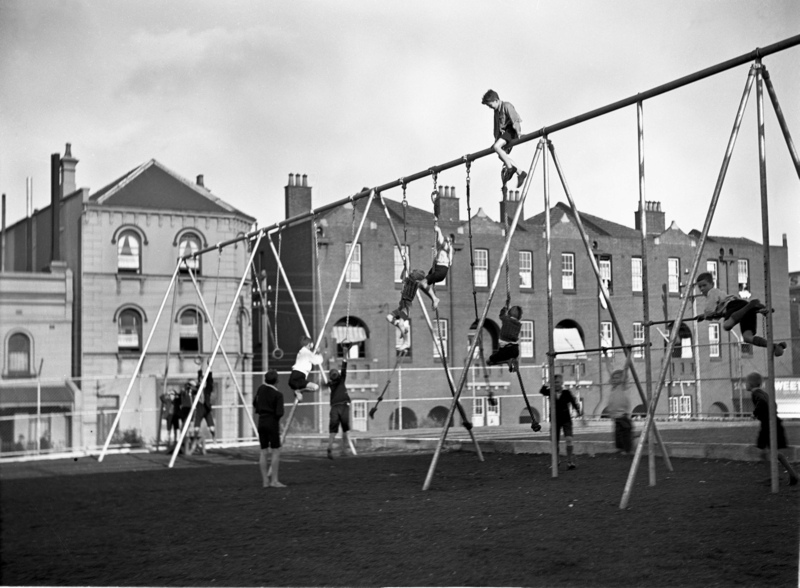 Children at King George V Memorial Children's Playground, York Street North (also known as Cumberland Street), 1930s. Sydney Reference Collection, City of Sydney Archives, SRC10534. Spring celebration at King George V Memorial Playground, York Street North, near corner of Gloucester Street. 6 September 1937 . Sydney Reference Collection, City of Sydney Archives, SRC11271. 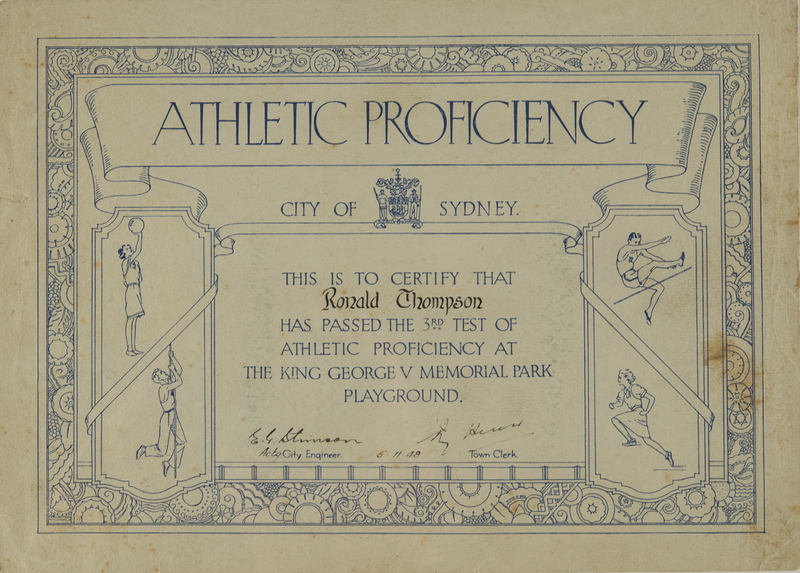 Certificate of Athletic Proficiency awarded to Ronald Thompson by the City of Sydney, 1948. Susannah Place Museum, Sydney Living Museums. 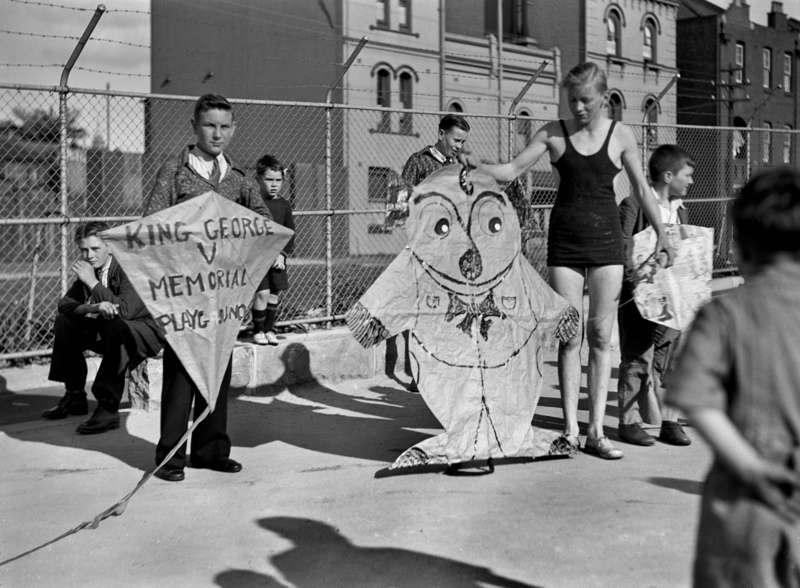 King George V Memorial Children's Playground, York Street North (also known as Cumberland Street),1930s. King George V Recreation Centre, The Rocks, 2012.